Skiing and snowboarding are inherently risky sports. Big Sky Resort makes this abundantly clear because it’s posted on big signs all over the mountain, printed on the trail maps, and written in fine print on the tickets and waivers that we all sign. The fact that skiing and snowboarding are risky shouldn’t be a surprise to anyone. Rocks, trees, cliffs, weather, snowcats, ice, chairlifts, avalanches, other people, and unmarked hazards really do exist. If you want to stay safe, be smart while you're on the slopes. Follow The Skier Responsibility Code - These simple rules serve as general guidelines to keep you safe. It’s your responsibility to know the code. Wear A Helmet - Helmets are warm and comfortable. They will protect your head in the event that you land on it. If you’re really getting rad, investing in body armor is also a good idea. Ski With A Buddy - At Big Sky, you might not see anyone else on the runs. If something happens, it might be awhile until someone finds you. Ski with a buddy at all times especially in the trees, off piste, or off the tram. Get In Shape - Skiing is a sport. Take the time to get in shape and stretch before you go outside and workout at high elevations. Take breaks and let your body recover. Read The Signs - Big Sky posts warning signs everywhere. These signs apply to everyone on the hill. They mark the runs, warn of hazards, and mark closed areas. Pay attention to the signs so you don’t get in trouble. Wear The Right Clothes - The mountain environment is unforgiving. It doesn’t care if you’re the best skier on the mountain. Wear the right clothes to keep yourself warm and dry so you don’t get frostbite. Use eye protection to prevent sun blindness. Use sunscreen to keep your skin safe. Take A Lesson - Proper technique can reduce your risk of injury. 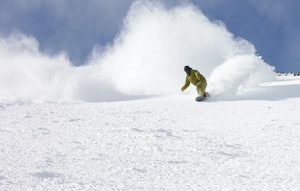 A snowsports professional can teach you how to ski and ride properly. 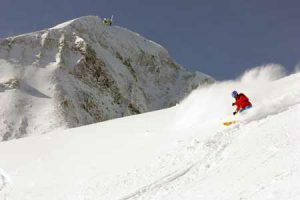 Hire A Guide - Ski trail ratings are not standardized across resorts. 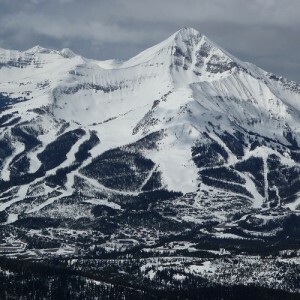 This means that Big Sky’s black diamond runs are not the same as black diamond runs in Colorado. If you don’t know the mountain, hire a guide from the Mountain Sports school. These pros can show you safely around the mountain. Check Your Gear - In the mountains, your life depends on your gear. Check your DIN settings. Double check that your boots and bindings are compatible. Ensure that all functions on your avalanche beacon actually work. Check that your skis still have edges. Upgrade your equipment if necessary. Your gear is your responsibility. Keep Your Head On A Swivel - Always watch out for other people at all times. Pay close attention in congestion zones, trail crossings, and in no fall zone terrain. Lower The Safety Bar - Always bring the chairlift safety bar down to reduce the risk of a big fall. It’s easy to stay safe while skiing this winter if you follow these tips and tricks. Stay safe and have fun.